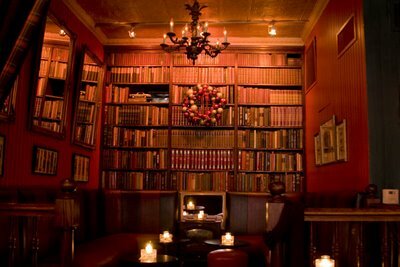 I spent a very manly evening at Hudson Bar & Books way down yonder on Hudson Street at Horatio with R, esq. This would be Holiday Spirits #4. R, esq. is another lost soul who I communicate with regularly but don’t actually get to see very often. Like most lawyers, he works. A lot. 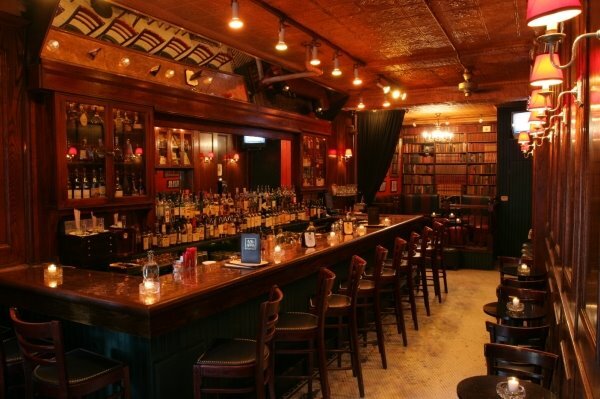 Hudson Bar & Books is a cigar bar. Smoking has been run out of town, so walking into a bar and encountering a cloud of cigar smoke is a bit unsettling. The testosterone practically drips off the walls and seeps down onto the copper-topped bar. This bar is so damn masculine that they play nothing but James Bond movies on the small TV in the corner. Last night they had You Only Live Twice on a loop. I was able to watch it one and a quarter times. The back room of the bar is a library. Nobody reads there. It’s just drinking and smoking. The books are for show. And a pretty show it is, especially for an old bookman like myself. There are women in the crowd but, generally, it’s a bunch of guys sitting around puffing cigars. They have a cigar menu and a whisky menu. No food. I don’t make a habit of smoking cigars but when the occasion calls for it I am happy to imbibe. I always end up smoking a stogy or two when in Vegas. 4 glasses of Dewar’s (2 straight up, 2 w/ soda) + 4 Dunhill cigars = $147.63 And that’s without the tip! No food, remember. Just alcohol and tobacco. Even for New York that’s preposterous. Well…that did include the Bond movie. 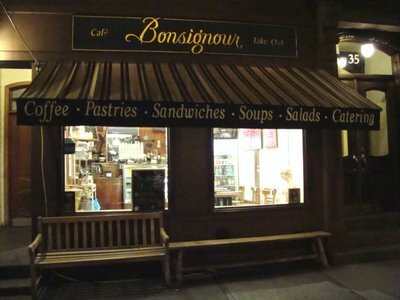 I got down the the Village a little early and had a cup of chili at this utterly charming bistro. 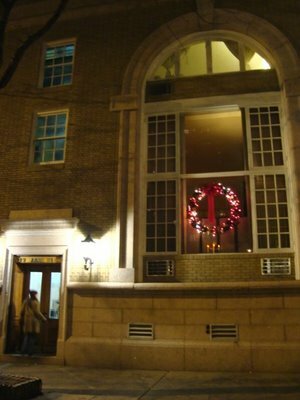 Next door to the bistro is the house I going to own someday. Dude, I love your blogs. And your excuses to drink are excellent. I’m using them myself!! G: Ah, a new reader! My ego is singing. No charge for the drinking tip. There’s plenty more where that came from! $150 for whiskey and cigars? Man, I can’t even relate to that.That bar looks like (and sounds like) something out of two centuries ago.Glad you enjoyed it though. Rob, I just spent $110 with a girlfriend & I for 5 drinks at Mesa Grill on 5th, between 15th & 16th (this was pre-dinner @ the bar for 45 mins). Are you wondering the food bill once we sat at our table?? Basically, I just gave the man my wallet and my most recentncopy of my brokerage statement, looked him in the eye, and left.I always go back though, at least twice a year. It’s like relatives. Greg – you must have expensive relatives :-)UB: let me know when you own that house. I’m coming over for a visit. so much testosterone in that bar? i grew some random chest hairs just reading it…spent $125 on 4 dirty martinis and two appetizers at the Ritz Carlton Battery Park when i was there. Good thing i wasn’t paying. and can’t believe that’s a HOUSE?!?! I’m not much of a bar guy these days, but that looks like a place I could get right comfortable.